An asteroid half the size of a football field gave Earth a historically close shave today (Feb. 15), and the first photos of the space rock encounter are starting to trickle in. 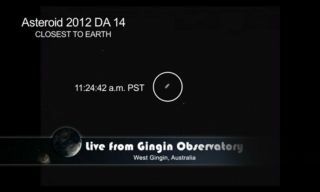 The 150-foot-wide (45 meters) asteroid 2012 DA14 cruised within 17,200 miles (27,000 kilometers) of Earth at 2:24 p.m. (1924 GMT) today, coming nearer than the ring of geosynchronous satellites circling our planet. It was the closest approach of such a large space rock that scientists had ever predicted in advance. Astronomers around the world trained a variety of optical and radio instruments on 2012 DA14 as it neared Earth, taking advantage of a rare opportunity to get an up-close look at a decent-size asteroid. Asteroid 2012 DA14, appearing as the white dot in the middle of the picture, was seen by the FRAM Telescope in Argentina, part of the GLObal Robotic-telescopes Intelligent Array (GLORIA) project, in advance of its close approach to Earth. It was obtained at 7:53 p.m. EST, or 4:53 p.m. PST, on Feb. 14, 2013. Other instruments locked onto the asteroid and photographed it as a bright dot; in these cases, the background stars are the objects that streak through the frame. 2012 DA14 was discovered in February 2012 by astronomers with the La Sagra Sky Survey in Spain. There was never a chance that it would hit Earth on this pass, and scientists say it doesn't pose a danger for the foreseeable future. Asteroid 2012 DA14 is seen by the La Sagra Sky Survey, Andalucia, Spain. Image obtained Feb 15, 2013. But the asteroid's close approach — and the dramatic fireball that exploded over Russia this morning local time, wounding perhaps 1,000 people — highlight the fact that Earth sits in a cosmic shooting gallery, scientists say. The planet has been pummeled by asteroids for its entire 4.5-billion-year history — perhaps most famously 65 million years ago, when the impact of a 6-mile-wide (10 km) space rock wiped out the dinosaurs. The good news is that NASA researchers have spotted almost all of the mountain-size asteroids that could threaten human civilization, and none of these behemoths appear to be on a collision course with Earth in the near future. But there are many thousands of smaller, undiscovered asteroids out there that could do serious damage on a local scale. Overall, astronomers think 1 million or more space rocks cruise through Earth's neighborhood, and just 9,600 of them have been cataloged to date.